The neighbourhood of Kitsilano, or “Kits” as the locals call it, is characterized by its beautiful shoreline, parks, and restaurants. Its close proximity to the beach, downtown, and Granville Island make this one of the most popular neighbourhoods in Vancouver. Originally home to the Squamish people during the 1800’s, the area was named after the Squamish Chief leader, August Jack Khatsahlano. During the 1960’s, the area flourished as the main hub of hippie culture. 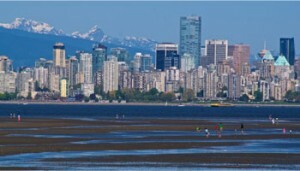 Although this has changed with subsequent decades of urbanization, organizations such as Greenpeace was founded in Kits. The neighbourhood is also well known for its cultural festivals, and its ties to the local art community. With live theatre performances and concerts outdoors, the warmer months attract many visitors to this area. Vanier Park, which hosts some of these performances, also boasts three museums, providing tourists of all ages with a wide range of activities. Kits Beach, one of the trademarks of this vibrant neighbourhood, offers a stunning backdrop of the North Shore mountains against the blue sea. Swimmers can also enjoy the scenic view from Kits Pool, Canada’s longest pool, extending 137m along the beach. A popular spot during the summer months, Kits Beach is the perfect place to play volleyball, jog, or sunbathe. Runners can experience the city’s trendy neighbourhood and gorgeous shoreline for 4KM during the course of the Marathon.